I know, tofu can be a sensitive subject. Every time I’ve posted a tofu recipe I’ve had multiple comments saying “looks good but I/my spouse/my children don’t like tofu.” Here’s the thing: tofu is what you make of it. It doesn’t have all that much flavor on its own, but is great at absorbing the flavors of whatever it’s cooked in. If it’s a texture thing, tofu comes in a variety of textures from silky to extra firm so you should be able to find one that suits your mood. I’m just saying, give tofu a chance. This coming from a meat eater. An avid one, in fact. But I think we all know that we should be cutting down on our meat intake for a variety of reasons, which will help the environment and our health. My love affair with tofu goes back to high school. One of my best friends worked in a vegan restaurant/deli that was conveniently located directly below my apartment (one of the many joys and conveniences of growing up in New York). Whenever I needed a break from homework or my parents (a one bedroom apartment with four nearly grown people was tight to say the least), I would head down to Sacred Chow and chat with Amy while munching on a plate of sautéed kale, stir-fried tempeh, or – my favorite, to this day – baked marinated tofu. I’m not sure what they did to make that tofu so spectacular but it lives in my memory as one of the best things I’ve ever eaten. I know. Tofu. If you’re still not convinced, take one look at these tofu tacos (which happen to be parve, vegan and vegetarian) and tell me you don’t want to try one. I think this recipe is perfect for anyone who claims they don’t like tofu, or who wants to ease in to tofu eating. The tofu is marinated in spices and lime juice to amp up the flavor, then put on a taco with black beans, corn, and all your favorite taco toppings. It’s so frickin good. Of course, if you really, really, really need your meat kick then you could substitute chicken, but I think even the most stalwart meat eaters will be pleased with this one. 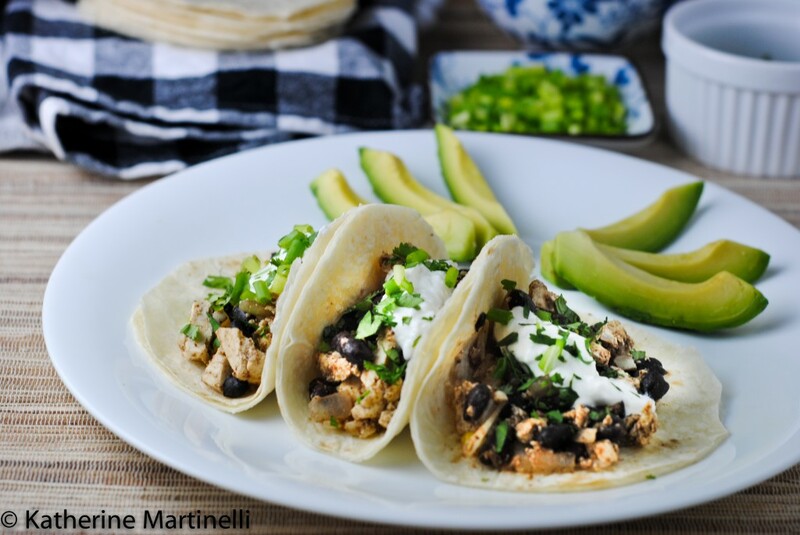 These flavorful tofu tacos are sure to appeal to even the most stalwart meat eaters. Plus they are parve, vegan, and vegetarian and so are suitable for a number of diets! Put the chile powder, cumin, coriander, and lime juice in a bowl and whisk to combine. Add the tofu and mash with a fork until the tofu is crumbled and fully coated. Allow to marinate while you prepare the tacos. Wrap the tortillas in tin foil and put in a 200F oven to gently heat while preparing the beans. Add the onion and garlic and cook, stirring often, 3 minutes or until the onion has softened (do not burn the garlic). Add the marinated tofu, black beans, and corn and cook until heated through and thickened, 5 to 10 minutes. Remove from the heat. Remove the tortillas from the oven. At this point you can either assemble and serve the tacos, or let everyone make their own. To assemble, spoon some tofu into a tortilla and top with the black bean mixture and any toppings you like. Chopped chives, chopped cilantro, sour cream, avocado, and shredded cheese all make nice toppings. This looks and sounds incredibly tasty! I truly love this recipe and combination of flavor, and of course your clicks too! Nicely done!!! Hi, thanks so much for the invitation. I am short of time this week, otherwise I would participate for sure. I love braised tofu with Asian mushrooms and vegetables… will endeavour to post the recipe soon! I totally understand Lizzy! braised tofu with veggies sounds just delicious. I had fun with my pie. Haha, thanks! Your pie looks amaaaazing! I linked up a bunch…hope you don’t mind. I love tofu and have a whole tofu recipes section on my site and tried to pick a few diverse choices. Your tofu tacos look to die for! Oh good! I’m so glad you linked up some of your fabulous tofu recipes, thanks Averie! I love tofu! Grumpy has taken some convincing but he will now eat it if I crisp fry it and coat it in sauce. He loves the Sweet Chili Lime Tofu sauce and actually complained the last time I made it that I didn’t make enough. 🙂 I’ve quite a few tofu recipes on my blog and have linked up a couple of them! That’s great that you’ve found a tofu preparation that he likes! Fried with sweet chili lime sauce sounds delicious. Thanks for linking up your great recipes! I do like tofu, but still don’t cook with it very often…I just sort of forget about it. Can’t wait to get some more ideas. I linked up my all-time favorite tofu dish today… Broccoli tofu. Thanks for hosting! I know what you mean, I used to forget about tofu all the time too, now I cook with it every week! Your broccoli tofu looks fab, thanks so much for linking up! Thanks! I am so impressed that you made tortillas!! I need to get your recipe. These do look tasty and I believe they do have the power to win over those non tofu eaters! Awesome inviting pictures here and great blog hop. Have a wonderful weekend! I love this and am a huge tofu lover. I cook with it frequently. Thanks for sharing. I used to hate tofu in my school days.. learn to appreciate tofu during university days (it’s cheaper on poor student’s budget!).. never crossed my mind to use tofu in tacos, so brilliant! what a great blop hop for tofu.. but I haven’t posted any tofu recipes yet, which reminds me I have to soon. I know what you mean about tofu being cheaper! That’s one of the many reasons I have started using it so often 🙂 Thanks Shannon! Can’t wait for you to post tofu recipes! I completely agree with you that we need to be more conscious of how soy beans are grown and how tofu is processed. There have been studies that processed vegetarian foods like fake meats are just as bad for you as processed meats. I like to think that tofu isn’t quite as processed. That is very cool that your brother-in-law grows his own! I eat tofu on a regular basis and cannot be without it;I don’t eat meat and my body clearly craves tofu! There are so many lovely ways to make tofu taste good:one of my favourite is tofu fingers,dipping pieces of tofu in a combination of cornstarch,rice flour and spices and then frying them until crispy,yummy! That sounds delicious, Yael! I will have to try that next time. Tofu is such a basic item in Japanese cuisine that I don’t know anyone (in Japan) who doesn’t like tofu. So I was very surprised to find out that not everyone likes Tofu when I started blogging! LOL. I really love this post, Katherine. I think it’s better for you to promote Tofu recipe than I promote tofu in Japanese cooking because the recipe like this everyone is familiar with taco but not with tofu so they are willing to try! I hope everyone realizes how great tofu is in terms of nutrition! What an interesting idea. These look fantastic! These look delicious! Thank you for sharing AND the link-up! Jill from Mad about Macarons suggested I come here! I’m SO glad I did! I’m new to using tofu, but I’ve really enjoyed it so far! Hi Katherine, this tofu taco looks *sooo* good! I love tofu and spices. So from looking at your recipe, I can tell I would love these tacos already. Tofu here is an excellent replacement to make a vegetarian dish. I’d love to try making this taco sometimes. Thanks for this wonderful recipe! Great recipe. I love the idea of tofu tacos. I don’t cook nearly enough with tofu, and when I do I’m usually in an Asian frame of mind. Gotta change that. Thanks for this. Thanks! I agree, I most often use tofu in Asian applications as well, but it is fun to get away from that. I love tofu and this tofu recipe. The plating is gorgeous and will be making these tacos for sure. So true! I need to start using it in sweet applications more often. Thanks Kiran! What a terrific recipe! I am a tofu fan, so I know I’ll love these tacos. The baked marinated tofu you mentioned sounds marvelous, too. I love that you could pop down and visit your friend so easily! Thanks Hannah!! I think you really would enjoy these. It was so fun to have my best friend work literally below my apartment – a high school gal’s dream! Hello! These sound great but just to be sure, you don’t cook the tofu, only marinate? these are basically the most disgusting thing ever. my bf made these following the recipe to the letter and they are nasty. threw away the whole pan and are heating up veggie burger right now. the tofu is mushy from putting liquid back in and the spice levels taste like nothing, added way more then called for and still crap. Nice text~ I learn more things! thanks!